Criminal is an eclectic, short-form true crime podcast, part of the Radiotopia network of eclectic, short-form podcasts. It’s genuinely a great listen, usually dealing with stories that are local, often in a historical context. The most recent episode, “The Finger”, deals with a white Oregon man who tested the limits of free speech protection by giving every cop he sees the bird. This episode highlights something that I think is important, if we wish to have healthy social justice activism. The question of how white people fit into Black Lives Matter as a structure is not new- the White Panther Party is proof of that. 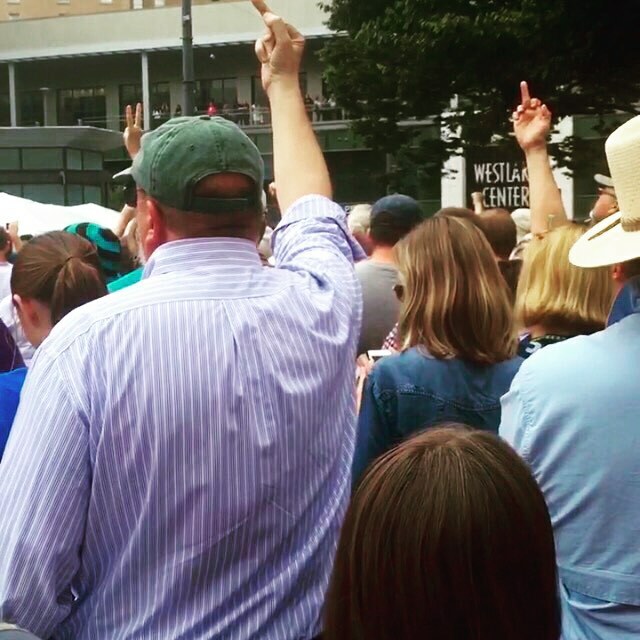 What “The Finger” represents is a deep double-standard where authorities criminalize speech for marginalized groups, but are indifferent when coming from traditionally dominant ones. If I decided to flip off every police officer I saw, there would be some consequences. My car would get pulled over more. Small infractions like jaywalking or speeding could get me fined. A cop might even yell at me and be confrontational. And though I can’t say this for sure, I’m relatively confident that I would not suffer bodily harm for my choices. This applies to acts of protest in general. The same action has a fundamentally different meaning depending on who does it. For me, the consequences are real, but limited. For a black person, someone LGBT-identified or undocumented, people have been killed for much less than The Finger. Recently I read a 2010 paper titled “The achievement gap and the discipline gap: two sides of the same coin?” (PDF). A section talks about how white and black students are disciplined for different acts, despite similar levels of misbehavior. reasons for referring White students tended to be for causes that were more objectively observable (smoking, vandalism, leaving without permission, obscene language), whereas office referrals for Black students were more likely to occur in response to behaviors (loitering, disrespect, threat, excessive noise) that appear to be more subjective in nature. The arrest of Sandra Bland was similar to this– based on subjective judgement about “attitude” and “disrespect.” Her minor traffic offense was inflated- despite white drivers doing a similar maneuver all the time. Similar actions, but vastly different consequences. So that gets back to privilege and protest. I have space that others do not- I can get away with more provocative and militant tactics. The police are more likely to issue warnings before physical confrontation. Authority figures divulge more information around me because they don’t automatically assume I oppose them. This means people with privilege can be the most provocative, visible members of the movement. In the process, it diverts attention away from communities that are under attack by the state. That’s unfortunate and counterproductive, because one of the most powerful aspects of Black Lives Matter is how dangerous it is to publicly confront the police as a black person in the United States. I can flip The Finger and curse out a police officer, but it doesn’t carry the same meaning. One line of thought is weaponizing privilege. That is, people with privilege should exploit it to fight for social justice. My critique of white supremacy, the theory assumes, has special meaning because it is a critique of one’s own identity. But at the same time, it feels like things are going in the wrong direction. Privilege used for noble purposes is still fundamentally unjust, and its use cements it within society. A counter, which after a year and a half around BLM, is that white, male allies are taking leadership positions within the movement when they weaponize privilege. I think that does happen, and I have witnessed it. Ultimately, I feel my actions should exist within the democratic framework of a movement. That is, not unilaterally using my advantages, but rather offering it as an option should others feel it can be used in some way. White people have a tendency to make decisions personally, and then seek retroactive approval. That’s dangerous and undermines social justice movements. Marginalized groups should have their autonomy acknowledged and respected. So I choose not to give cops The Finger, because most people cannot. It is important to respect how dangerous activism can be for certain groups of people, and not casually antagonize just because I can get away with it. There’s a nice three-minute video released today by Al Jazeera America, part of a much wider collection of material on the 25th anniversary of the Americans with Disabilities Act (ADA). It’s about playground accessibility, which is a struggle that has emerged largely in the aftermath of the ADA. Indeed, in the year I spent on a county disabilities commission, the ADA compliance committee (its most important part, since they decide how to spend limited grants from the state and federal governments) spent a huge chunk of time on playgrounds. Basically no playgrounds created prior to the ADA met code. Like all other structures, they have to evolve with the many amendments to the Act, which have made many new areas in violation. Disability accommodation and accessibility are civil rights struggles. The failure of conservative lawmakers to pass the Convention on the Rights of Persons with Disabilities due to a series of vague, conspiratorial concerns is not the exception, but rather part of an ongoing undermining of a large, diverse group of oppressed people that was in no way ended when the ADA was signed. How tax money is spent is a reflection of a society’s commitment to their ideals. The United States prioritizes defense spending above programs that would help implement what the Constitution and American idealism espouse. Indeed, how much time and attention is paid to playgrounds can tell us much about the larger social justice struggles of the 21st century. I finally wrote a full post on this tension I’ve had since September 2014 when I gave a guest sermon. This is based on “Not my father’s religion”, published in 2007. The contradictions in what UUs promise to do in the world and the distance they’re willing to do the radical things required is difficult. As an impatient young UU this bothers me- lots of people who were 60s radicals but have now settled down and ditched the needed politics. This is not a lovely, soft sermon like many here. They are beautiful, but certain issues require a hardened tone. Do know that this is in the vein of Frederick Douglass, the greatest black orator in American history, when he told a group of Unitarian abolitionists, the UUs of their day, that he loved them all but would give them Hell for these twenty minutes. The issue starts as the central point of “Not my father’s religion” by Reverend Doug Muder, from UU World. In it, he explains why his working-class factory worker father goes to a conservative Lutheran church, and not the one he preaches at. The article, which a masterwork of cutting through assumptions and stereotypes, comes to the conclusion that UUs have very few working-class members, and their beliefs contribute to that. From an upper middle-class professional core, members don’t see the insecurity and danger in the world that regular laborers do, and often spend more time talking about the homeless than the near-homeless. There is always a danger of hidden elitism- when we use the term “flipping burgers” we often devalue that working at a Wendy’s is hard, unrewarding toil. This taps into what I’d like to talk about, something that guided a 2014 guest sermon I gave called “And Society at Large”, which was about that Principle Five of the Seven Principles we cherish calls for democracy in all of society, including economic democracy. For the purposes of the sermon and the fact that “economic democracy” is a wide-ranging term, I didn’t use words like “socialism”. But the message that many got was clear- the church needs to live up to its radical talk. This is a church that, bluntly, is the radical children of the 1960s teaching a much more watered-down set of values to their own kids. One person who sat up after the speech to make an announcement irritated me. Two things were annoying- first, she was making a regular political announcement (though I know the contradiction given my sermon) in the church sanctuary that is normally done outside. And secondly, she credited me as the inspiration to talk about how she needs everyone to go to the Democratic Party offices to work on the elections. The biggest blow was not that I think the Democratic Party is a dead-end for the radical and religious, though I do. It’s that she took my leftist message and turned it into the kind of milquetoast liberalism that gives the Party its nickname- the graveyard of social movements. It’s the repeated appropriation- of gay liberation, of black resistance, of the mass left-wing movements that defined the twentieth century in many places, including the United States. These groups become cogs in a party machine and lose their independence. The black American experience we are seeing with police violence is clear- some leaders have long since joined the party apparatus, and thus their criticisms have evident limits. The young insurgents that I admire so much have sometimes booed Al Sharpton off the stage, because they’re too smart to be sold on a plan that doesn’t work. Smaller groups cannot influence large machines in the way that big money and white voter issues do. The organization I am a part of rejects the two parties and sees that the only way to gain economic democracy, egalitarian society, and all these things that by the Seven Principles we are morally obliged to strive for- is to build a working class alternative that lacks the compromises that define the two big parties. And I felt our 2013 campaign in Seattle was an example of what many UUs may one day see as necessary- a challenge to liberal Democratic politics that are too tied to businesses and interest groups to achieve change. Running under the then-insane demand of a $15 an hour minimum wage, our candidate Kshama Sawant- an immigrant woman of color, organizer, and professor- beat him out by the slimmest of margins, winning almost 94,000 votes. And what happens with that radical alternative. The $15 an hour wage became a reality in Seattle, and now spread to San Francisco and Los Angeles, coming soon in Chicago and Minneapolis, New York and Berkeley. A ordinance was passed to stop landlords from raising rents by more than 400% (!) to keep gentrification at bay. Homeless encampments are allowed to stay rather than broken up by police every week or so. And the new budget is the most progressive in the country, including record funding for homeless LGBT youth and looking to invest in mass transit. Currently the struggle in Seattle is over a large oil rig headed to drill in the Arctic- given the chance by the Obama administration- where hundreds of indigenous people and environmentalists block the way out with their kayaks and banners. 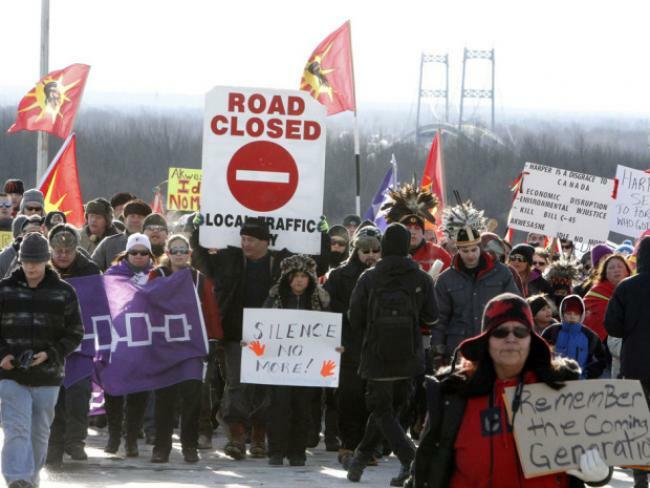 Idle No More indigenous activists in Canada block a highway. In essence, the UUs need to change their principles or change their tactics. Many UUs will support the Democratic candidate, and I understand that. But without our own political power we will never win the victories that match our moral expectations. Indeed, when Democratic clubs all over Seattle held their 2015 endorsement meetings, they all came back with an endorsement in our district of “none of the above”- since our non-Democratic candidate cannot be directly endorsed. There is a split available more than ever in recent time between the establishment and the activists. Unitarian Universalism would benefit from class diversity, just like it would from racial diversity, and more immigrants, and other things we discuss all the time. But class diversity is not going to be gained by tabling outside union halls and pawn shops. Our ideas are great but their expression is biased in favor of the well-educated, and those in communities that are not in crisis. I don’t see how a black janitor in a community where young men are being shot in the back will find our progressive ideals right for him, because they’re never communicated in the way he might see things. 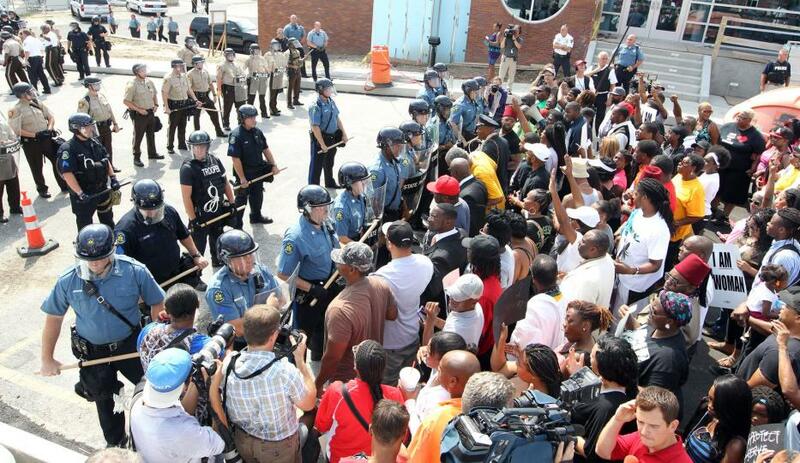 Standoff between protesters and armed police in Ferguson, Missouri. 2014. As the new generation, I understand that I will be on the radical fringe until I settle down, have kids, and pay dumb taxes. But since what the UU needs are people who might see my worldview as better aligned with theirs, I can’t just be flatly ignored. We can do this. Let’s be the radical kooks that our ancestors were when they said that slavery was an abomination and rose up as whole towns to chase slave catchers out of the North. They were one moderate reformers, but they saw the Light that radical solutions were needed to serious problems. Abolition stopped being symbolic the moment it became extralegal. The Thoreau quote is famous and forever relevant: “There are a thousand hacking at the branches of evil to one who is striking at the root.” All public policy, all activism, all social justice effort expended lies within the tension between branches and roots. It’s a dialectic, where no answer is fully satisfactory. If the focus is entirely on roots, the branches of injustice will harm innocent people in the meantime. If the focus is entirely on branches, society can only tread water, the problem never ending. Martin Luther King Jr. put the issue in different words, when he eulogized Rev. James Reeb (PDF), a Unitarian Universalist minister bludgeoned to death by white racists in Selma, Alabama. His death is treated with the gruesome, horrifying tone is deserves in Selma. To King, branches are the question of “who”, and roots are the question of “what”. Hate crimes have tangible perpetrators- those that directly order killing or participate in the killing act. Hate itself goes beyond the individual, into the very fabric of society itself. King is right- society is complicit in racism, sexism, homophobia, and inequity of all types. All evil exists within a world that we helped create. Today, as it was fifty years ago in Alabama, we are spending so much time performing triage. There is no shortage of suffering to soften if we wish to keep looking. Yet we cannot roll into bed exhausted each day, and not think about prevention. Helping the homeless is important, but not the same as preventing vulnerable people from becoming homeless in the first place. Exonerating the innocent about decades behind bars is not a substitute from preventing the innocent from being placed there. The tension between roots and branches, between what and who, sits in a battle between past and future. Present society is habitually bailing out past society. At least a dozen times in my life, someone of an older generation has said that the world is in the hands of Millennials. They tried to save the world, failed, and there’s nothing left to due but transfer the weight. Mending past injustices has to be mixed with preventing present injustice, for each new tragedy compounds and worsens each tragedy that emerged before. Psychologically, how does one deal with the truth that one cannot strike both the root and branches completely at the same time? How can we take both success and failure in the same moment? We cannot do everything, but the world needs saving. Tension will always exist, and each step towards justice has to be evaluated. The process encourages self-reflection, and there is always the threat of self-consciousness rising, to become overwhelming. between injustice, today, yesterday, and a thousand years ago, unremedied.